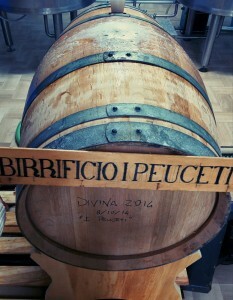 The Divine is the expression of our imaginary in which the Mediterranean culture of eating and drinking well meets the brewing tradition, in which the passion in the production of the beverage of Ceres marries our culture of Puglia wine. The main line of our beers proposes a trip to the Apulian territory, while in the line of experimental beers the dimension changes and our journey is reproposed on time. 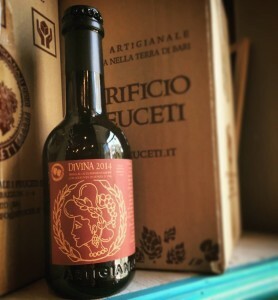 La Divina is a journey through time to discover the aromas and flavours that nature can give us, the pursuit of beauty in harmony, of balance in exaggeration, with the contribution of oak wood, malts, natural and uncooked grape must, hops and Of the ingredient segreto…il time! 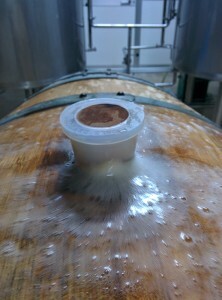 It is precisely the time that distinguishes our repropositions of this idea resulting in a unique beer in every vintage. Thus from the Divine 2013, with a small production for a few intimates born from a experimentation of combined fermentation of the must of our Baresana beer with small grape must produced in the lands of Palo del Colle by the expert vine-grower, passionate about beer and friend Nicola of the homonymous and award-winning wineries Toto, we thought of the Divine 2014 with an additional element of experimentation: the introduction of wood and wild yeasts! With an almost manic planning, the fermentation of Baresana was initiated according to our protocols, coinciding with the grape harvest of Minutolo that was allowed to stand for a few days in the country air, to ensure that the nature He began to fulfill his magic, making it more mature and aromatic. Thereafter the manual separation of the grapes from the sprig ofgrapes and after the pressing the union in an oak barrel French. 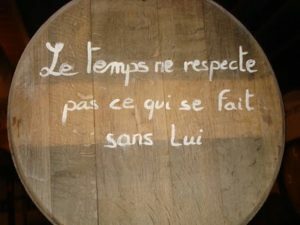 It is then time for the natural yeasts that have given their important contributo…ma the best is yet to come! Beyond a first test carried out in 2013, the Divine is produced every 2 years, so we have the Divine 2014 and the Divine 2016, the reference year is relative to the vintage of Minutolo used however the commercialization takes place always in the year following Completed maturation. -Denomination and alcoholic grade: Special beer with small grapes, 6% ALC. Vol. La Divina is a very complex beer characterized by the use of “raw” must of small grapes during fermentation with a subsequent maturation of 12 months in oak barrels French. The aroma is therefore very expressive and full of the typical characteristics of the minutolo of yellow fruit, spices and flowers with the funky contribution of wild yeasts that, in harmony with the aromas, characterize the taste with a delicately acidic contribution that increases The freshness and ease of drink.